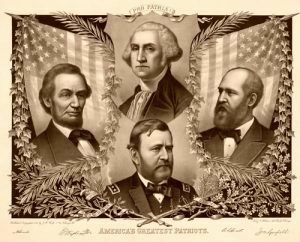 America’s Greatest Patriots – Presidents George Washington, Abraham Lincoln, William McKinley, and James Garfield, by Kurz and Allison, 1890. First President of the United States, Founding Father, and Commander of the Continental Army in the American Revolution. He presided over the writing of the Constitution in 1787. Vice President to George Washington, 2nd U.S. President, and Founding Father of the United States. The third President of the United States and principal author of the Declaration of Independence, he is known for his promotion of the ideals of republicanism in the United States. He is considered one of the most influential Founding Fathers. Politician, political philosopher, 4th President of the United States, and one of the Founding Fathers of the country. He was instrumental in writing the Constitution and wrote the Bill of Rights. As leader in the House of Representatives, Madison worked closely with President George Washington to organize the new federal government. As Thomas Jefferson’s Secretary of State (1801–1809), he supervised the Louisiana Purchase, doubling the nation’s size. A series of disasters at the beginning of the War of 1812 damaged his reputation, but by 1814–15 American forces repulsed major British invasions, and he recovered. 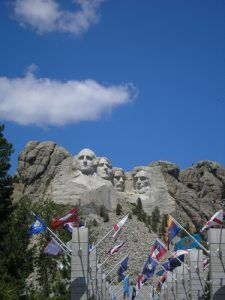 Mount Rushmore, photo by Kathy Weiser-Alexander. The 5th President of the United States and the last Founding Father to become a U.S. President. He is most noted for his proclamation in 1823 of the Monroe Doctrine, which stated that the United States would not tolerate further European intervention in the Americas. The son of Founding Father, John Adams, he was a politician, diplomat, and served as the 6th President of the United States. Historians agree he was one of the great diplomats in American History. Adams had previously served as an ambassador to several European countries and as a U.S. senator from Massachusetts. He is the only president in history to serve in the U.S. House of Representatives after leaving the presidency. Adams’s fierce sense of independent judgment meant that he never completely fit the mold of any political party, and he was surely the only president to have a pet alligator in the White House! 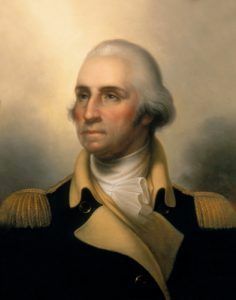 The 7th President of the United States, he also served as the military governor of pre-admission Florida and commander of the American forces at the Battle of New Orleans in the War of 1812. Dominating American politics in the 1820s and 1830s, he helped to shape the Democratic Party. The 9th President of the United States, military officer, and politician, he was the first president to die in office. He had the shortest tenure in presidential history. As an Army officer and governor of the territory that is now Indiana and Illinois, he fought Indians and made harsh treaties with them, clearing the way for more westward settlement by whites. His military victories against Indians made him a hero to white Americans. Harrison’s father, Benjamin Harrison, signed the Declaration of Independence. William Henry Harrison’s grandson, also named Benjamin Harrison, became the 23rd president. The 10th President of the United States, he was the first to succeed to the office following the death of a predecessor. As president, he stood against his party’s platform and vetoed several of their proposals, resulting in most of his cabinet resigning and the Whigs expelling him from their party. His most famous achievement was the annexation of the Republic of Texas in 1845. Tyler had other “firsts” as president: His first wife was the first wife to die while her husband was still president, and he was the first president to marry while in office. Tyler was the last of the Virginia aristocrats in the White House. He was a Southerner until his death, even being elected to the Confederate Congress after unsuccessfully trying to keep the Union from dissolving and entering the Civil War. He was the only president who also allied himself with the Confederacy.